Q. How do I stop a Preferred Search from sending me emails? To change the settings on your Preferred Searches, you will have to log in to the Classic Catalog. 1. From our homepage www.sfpl.org hover over the BOOKS & MATERIALS tab and select CLASSIC CATALOG. 3. Enter your Library Card Number and your Personal PIN number and click the LOG IN button. 4. 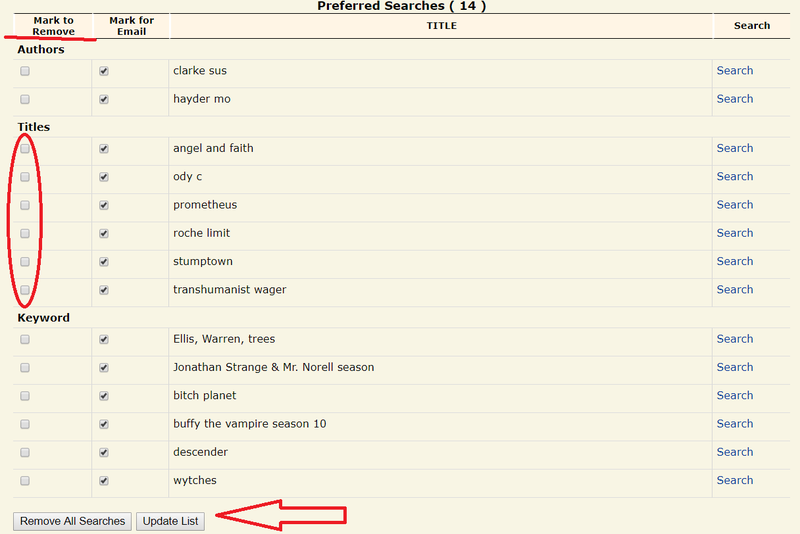 Click on the PREFERRED SEARCHES option from the Library Record Options menu. 5. Check the box under MARK TO REMOVE next to any searches you want to stop receiving emails for - then click UPDATE LIST. Once the items are removed from your Preferred Searches, you should stop getting emails.